In addition to their health knowledge, Community Health Workers have intimate knowledge of the community they work in and can provide unique insight to the strengths, weaknesses, and needs of those they serve. A Community Health Worker is a trusted member of your own community that serves as a link between you and health or social services. They understand the needs and viewpoints of the community and provide the necessary tools and information so you can make informed health care decisions. Community Health Workers will teach you how to manage your chronic condition(s) or guide you in the direction of someone who can. Cultural differences in values and beliefs can create feelings of distrust between patients and health care providers. While doctors and nurses have lots of valuable medical knowledge, sometimes it can be uncomfortable to discuss certain subjects with them and/or maybe language barriers exist, making it hard to understand the information they’re providing. Community Health Workers help to reduce these barriers by catering health information and resources to that of the individual. Also, Community Health Workers aren’t as costly as licensed health professionals. As far back as the 1940s, it’s documented that regular people have been trained to assist with medical services when funds were unavailable for doctors or nurses. Are there community health workers in Wyandotte County? Yes, but funding is very limited. Only a few organizations have paid CHW positions, while some churches and non-profit organizations offer CHW-like services through volunteers. For example, El Centro and Juntos Advancing Latino Health coordinate Promotoras de Salud programs, NBCCDC has a group of volunteer CHWs that work with their health ministry, and we (CHC) have launched The Community Health Worker Collaborative for Wyandotte County in partnership with KC CARE Clinic. Although there’s currently little compensation for these positions in Kansas, the work of CHWs is steadily becoming a central element to improving health outcomes for low-income, underserved, and diverse communities nationwide. The Affordable Care Act recognizes CHWs as important members of the health care workforce, and the Center for Medicare and Medicaid Services (CMS) recently changed Medicaid regulations allowing for states to reimburse for preventive services “recommended by a physician or other licensed practitioner…within the scope of their practice under State law”, including the use of CHW services. 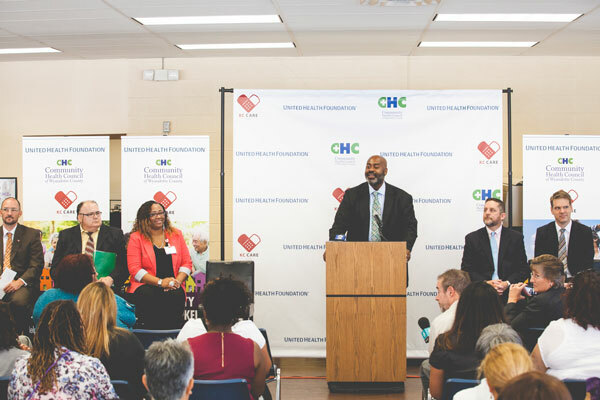 For these reasons, The Community Health Council is partnering with other local agencies (named below) and the Metropolitan Community College to promote and support the expansion of CHW in our County. We hope that one day CHWs will be utilized to their full potential so our residents can reap the benefits of the culturally competent, one-on-one, patient-centered services. To become a Community Health Worker means that you’ll be supporting the lives of so many of your neighbors. It also means you’ll be joining a coalition of health professionals that span every corner of the community. The network of collaborative partners for the CHW movement in Wyandotte County is truly impressive. Along with The Council, this group includes Juntos, NBC Community Development Corporation, the KC CARE Clinic, the Historic Northeast Midtown Association, and El Centro. There is also great work taking place at MARC through the Kansas City Regional Community Health Worker Advisory Committee. Contact Lucia to learn more. Interested in becoming a CHW? Great! You can learn more about the position, the program, and even sign-up for the Community Health Worker course at Metropolitan Community College, all by contacting Sandy Snook via sandy.snook[AT]mcckc.edu or 816-604-4918.